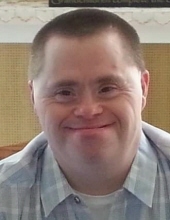 Waterville-William A. Ford, 51, formerly of Oriskany Falls, passed away with the love and support of his family, on Saturday, April 6, 2019, at the Waterville Residential Care Center. Billy was born on August 8, 1967 in Hamilton, the son of the late Arthur and Hilda Way Ford. He graduated from BOCES Special Education Program. In Billy’s earlier years, he was a proud participant of the Special Olympics Program. Thru Billy’s association with Oneida County ARC Program, he had volunteered at the Waterville Residential Care Center. Most of all, Billy will be remembered for his devotion and love to his parents, his brothers, and any person that touched Billy’s life. Billy is survived by his loving family, his brothers, Mark and Doreen Ford of Caroga Lake, Dale and Florence Ford of East Stroudsburg, PA, Dennis Ford of Deansboro, Rev. Jack and Penny Ford of Boonville. Billy is also survived by several nieces, nephews and cousins. He was predeceased by his parents, Art and Hilda Ford, his brothers, Roger S. Ford and Rodney K. Ford, a sister in law, Jean Ford, and his nephew, Trevor Ford. In memory of Billy, kindly consider a donation in his name to the ARC of Oneida and Lewis Counties, 245 Genesee Street, Utica, New York 13501. To send flowers or a remembrance gift to the family of William A. Ford, please visit our Tribute Store. Funeral Service to Follow Visitation. "Email Address" would like to share the life celebration of William A. Ford. Click on the "link" to go to share a favorite memory or leave a condolence message for the family.